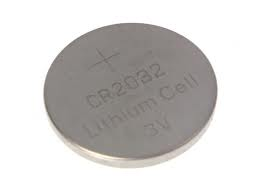 CR2032: 3-volt Lithium Primary (non rechargeable) battery. Replaces CR2032, BR2032, DL2032, LM2032, etc. Size is 20mm in diameter, and 3.2mm thick. Available Plain, or w/ Solder Tabs (special service; $3.45 extra per cell). The Solder Tabs are metal straps which are carefully spot-welded to each side of the battery, with insulation. With these tabs, the battery can be mounted on a circuit board, or wires can be soldered onto them.